Improve your look and feature your brand! Anyone who's tried to buy a small quantity of custom printed bubble envelopes knows how difficult it can be. At Elite Envelope, we've solved that problem and you'll love what we can do. The items pictured above were printed in this fashion. Printing on the bubble envelope will give you a more professional look than sticking on a label. It will set apart the mail from the ordinary and let your customers know that they are receiving something special. We're more than happy to print small quantities down to a single carton. Or as many as you'd need. Secondly, we can print up to four colors even with full coverage on the front and back with our trademarked "Smart Bubble" product. By using a removable bubble sleeve, we are able to print pretty much any type of coverage on a paper,Tyvek or Herculink envelope first and then insert the bubble sleeve. 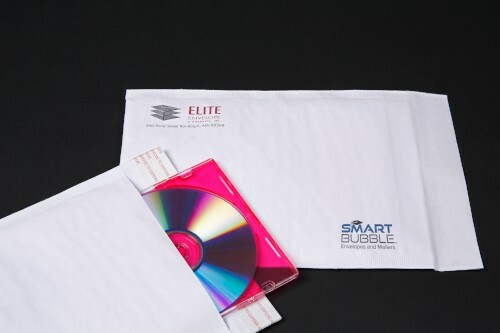 The protection is exactly the same as a stock envelopes and it has the added benefit of allowing the bubble sleeve itself to be reused or recycled rather than thrown in the trash with the envelope – hence the “Smart” part. 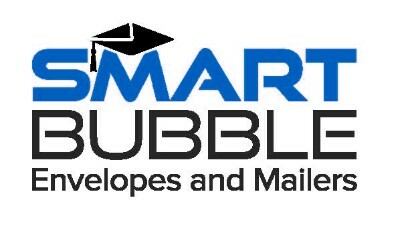 For Smart Bubble orders, there are no size or ink coverage restrictions (up to four colors). Certain sizes will be less expensive than others and open end or catalog style envelopes will be less expensive than open side or booklet style envelopes in most cases. And there are no minimums on this style either. We'll quote on whatever quantity you require. These jobs are all considered custom so just contact us for a quote or if you have any questions.